Kathleen Paulson's brother, Ethan, and his band, The Flaming Gerbils, are spending some time in Mayville Heights. Ethan and his band-mate Derek, are giving a song-writing workshop at the St. James Hotel when they stumble upon the body of Lewis Wallace. The former football player was considering the town for the site of his newest business venture. However, not everyone was a fan of the brash ex-athlete, who had a failed business, some disgruntled customers, and several lawsuits in his past. Did he make a new enemy, or did Lewis Wallace's past finally catch up with him? 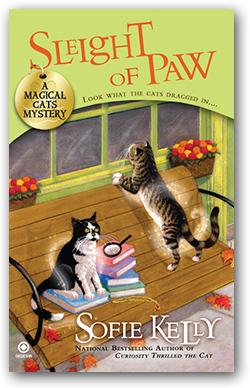 It's up to Kathleen—with some furry assistance from Owen and Hercules—to figure out who was trying to settle the score. The Wild Rose music festival is underway in Mayville Heights and the whole town is excited, including librarian Kathleen Paulson and her two magical cats, Owen and Hercules. But then the trio and their friend, Ruby Blackthorne, stumble across a dead body while they're taking photographs down by the river. The victim is a close friend and assistant of the popular cabaret singer, Emme Finley, who was set to perform at the festival's closing concert. 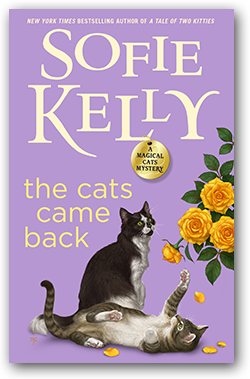 As accusations abound and suspicions swirl, Kathleen and her furry sidekicks will put their abilities to the test, as they work to catch a devious and surprising killer. The return of the Janes brothers has Mayville Heights buzzing. Everyone of a certain age remembers when Victor ran off with Leo's wife, who then died in a car accident. Now it seems the brothers are trying to reconcile, until Kathleen finds Leo dead. The police set their sights on Leo's son, Simon, who doesn't have much of an alibi. To prove Simon innocent, Kathleen and her furry friends will have to dig deep into the town's history. Kathleen is excited to meet three old friends of her boyfriend, Detective Marcus Gordon, while they visit Mayville Heights on business. But the reunion is cut short when one of the friends is killed—and the evidence points toward Marcus as the murderer. Though it seems she doesn't know all of Marcus's secrets, Kathleen is sure he's no killer. 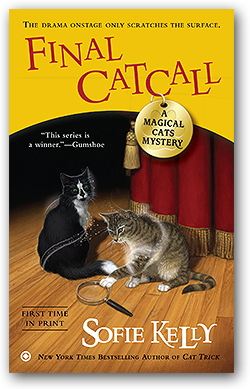 With his suspect status sidelining him from investigating the case, it's up to Kathleen and her feline partners-in-crime, Owen and Hercules, to find whoever is framing Marcus—and make sure the good detective hasn't found his last clue. Normally, the arrival of an art exhibition at the Mayville Heights library would be cause for celebration. But thanks to the overbearing curator and high-tech security system that comes with it, Kathleen's life has been completely disrupted. But when Kathleen stops by the library late one night and finds the curator sprawled on the floor—and the exhibition's most valuable sketch missing—it's suddenly time to canvass a crime scene. 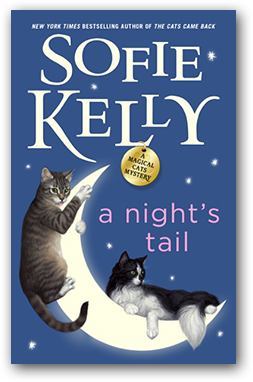 Now Kathleen, her detective boyfriend Marcus, and her clever cats have to sniff out a murderous thief, before anyone else has a brush with death. Kathleen is hard at work organizing a benefit to raise money for the library's popular Reading Buddies program. 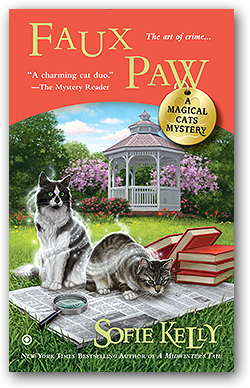 When a guest at the gala drops dead, her magical cats, Owen and Hercules, will have their paws full helping her solve a murder. The victim is the ex-wife of businessman, Burtis Chapman. And though everyone is denying knowledge of why she was back in town, as Kathleen begins nosing around, she discovers more people are connected to the deceased than she expected. 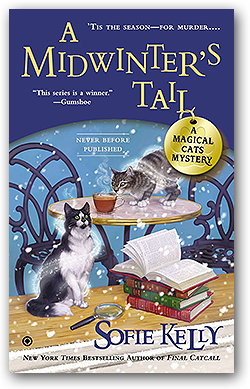 Now Kathleen, her detective boyfriend Marcus, and her uncanny cats have to unravel this midwinter's tale before the case gets cold. With her sort-of boyfriend Marcus calling it quits and her ex-boyfriend Andrew showing up out of the blue, Kathleen has more than enough drama to deal with—and that's before a local theatre festival relocates to Mayville Heights. Now the town is buzzing with theatre folk, and many of them have their own private dramas with the director, Hugh Davis. When Davis is found shot to death by the marina, he leaves behind evidence of blackmail and fraud, as well as an ensemble of suspects. Now Kathleen, with a little help from her feline friends, Owen and Hercules, will have to catch the real killer before another victim takes a final curtain call. The local businesses of Mayville Heights hope to convince Chicago-based company Legacy Tours to sell a vacation package for their town. Legacy Tours partner Mike Glazer grew up in Mayville Heights, but he's no longer the small town boy people once knew. Even the local bootlegger has an issue with the bossy loudmouth Mike has become—until someone shuts him up for good. When Kathleen discovers Mike's body on the boardwalk, she can't help but get involved in the investigation—even if her boyfriend, Detective Marcus Gordon, would rather she didn't. 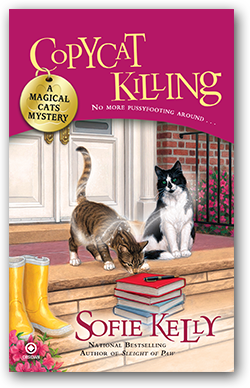 Now, with a little help from her cats Owen and Hercules, it's up to Kathleen to make sure the killer is booked for an extended stay in prison before someone else takes a permanent vacation. It's been raining cats and dogs in Mayville Heights and now the local artists' co-op is on the verge of flooding. Kathleen has been up all night helping her friends move their creations to the safety of the upstairs studio. The artwork survives, but when controversial mask maker Jaeger Merrill is found drowned in the co-op basement, Kathleen questions whether his death was accidental. After she discovers the artist was using an assumed name, she realizes she can't actually assume anything about him. 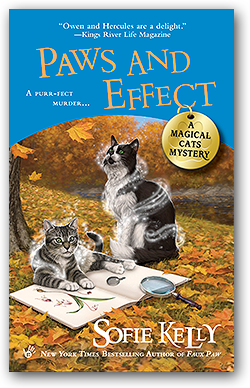 With the help of handsome detective Marcus Gordon—and Owen and Hercules's extraordinary powers of feline detection—it's up to Kathleen to unmask a killer. 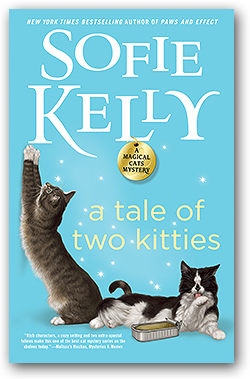 When Owen and Hercules followed her home from Wisteria Hill, the old Henderson estate, Kathleen realized her mind wasn't playing tricks on her—her cats did have magical abilities. 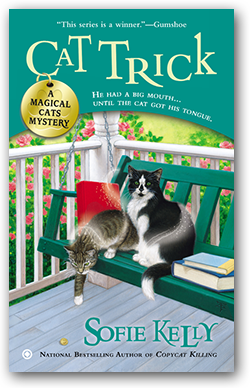 And when the body of elderly Agatha Shepherd is found near her favorite cafe, Kathleen knows Owen's talent for becoming invisible and Hercules's ability to walk through walls will give the felines access to clues she couldn't get without arousing suspicion. It will take a bit of furtive investigating to catch a cold-hearted killer. 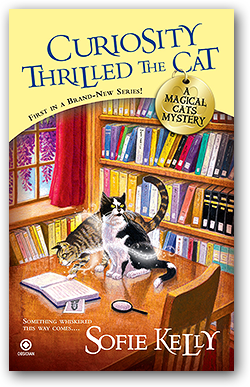 Meet small town librarian Kathleen Paulson and her very special felines, Hercules and Owen, in the first novel in the New York Times bestselling Magical Cats Mystery series.